Stellar shock waves in space. I’m Shocked—SHOCKED—to Find That Fluid Dynamics Is Going On Here! This is either a gigantic shock wave from a star screaming through space, or the Flying Spaghetti Monster. Probably the former. On human spatial and time scales, stars seem motionless. Sure, they rise and set, but that’s a reflection (literally) of the Earth spinning on its axis once a day. But the stars themselves move, orbiting the center of the galaxy. Stars are so terribly far away that this motion appears diminished to almost nothing; you need a telescope and lots of time to even measure it. But in real terms they’re hauling mass; the Sun, as an example, is moving at a staggering 220 kilometers per second around the galactic core. That’s three quarters of a million kilometers per hour! In general, though, that motion has little effect on the galaxy itself. If you’re traveling through a vacuum, who cares? There’s nothing to get in your way. But in reality there’s stuff in the way: The ethereally thin gas and dust between stars. This material makes a lab vacuum look like a thick soup; there may be only one atom for every cubic meter of space out there. Some places are denser, with hundreds or millions of particles per meter3, but even that is thin stuff. But it adds up. And while a star itself is small, massive stars are hot, and blow a wind of particles out from them like a solar wind. This wind can extend for billions of kilometers, well out into space. Now combine all this: Take a massive, hot star, let it blow a huge wind, and set it free to blast through space at hundreds of kilometers per second. What do you get? You get what you see in the photo at the top of this post: a shock wave. Like water flowing around the bow of a ship, the interstellar material gets compressed in a vast curve in front of the star. 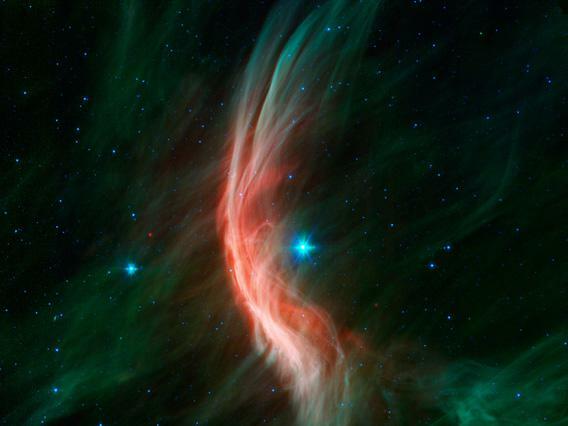 I’ve written about this before; one of my favorite astronomical photos of all time shows the massive star Zeta Ophiuchi ramming through material in space, creating a spectacular bow wave. Zeta Oph is very photogenic in the infrared. 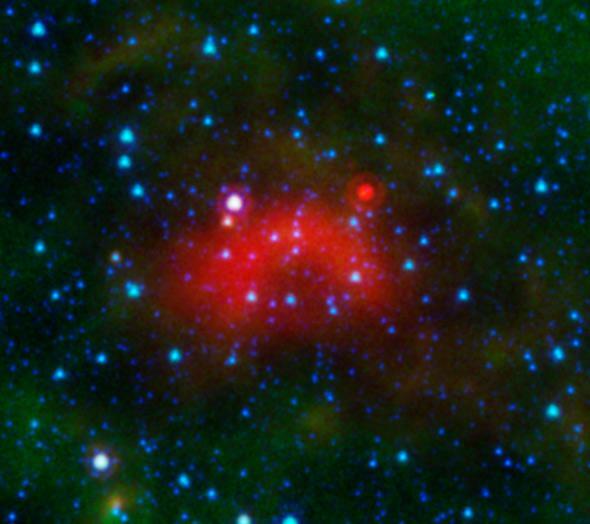 The material warms up and glows in the infrared, making it easy to spot with space observatories like Spitzer and WISE, which are both sensitive to those wavelengths. Astronomers combed through the data, identifying over 200 such curved structures. Follow up observations on 80 of them showed they were due to speedy massive stars (some are created in other ways, like patchy gas and dust around a newborn star compressed by the baby’s violent outbursts). It’s always best to fly through the galaxy with a friend. 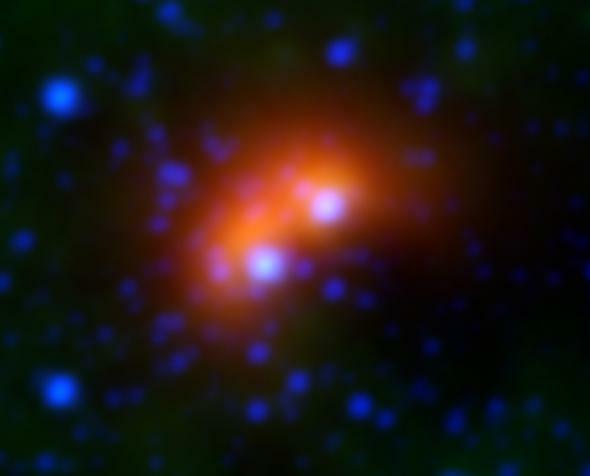 One such wave they found is pretty cool; it’s actually from two stars. Seen here, the stars are HD240015 and HD240016, and the waves overlap, like a curvy M. The stars are both B-types, hotter and more massive than the Sun. However, I couldn’t find much info on them. They must be related, perhaps born in the same cluster. Usually, stars moving fast enough to create these waves were ejected from clusters, tossed out by a close encounter with another star, given a velocity boost by the gravity of the combined masses of all the other stars. I wonder if these two were together when they were kicked out, now traveling through the galaxy as a matched pair. I like studies like this. We learn about the way stars emit material, how they move through space, and just what they’re moving through. And we also get such cool images! It’s a reminder that the Universe is in constant motion, and the scales are vast. And it helps personally, too. I figure if an octillion-ton star can rocket through space at dozens of times faster than a rifle bullet, I can probably be coaxed out of my chair every now and again and move around a bit myself.